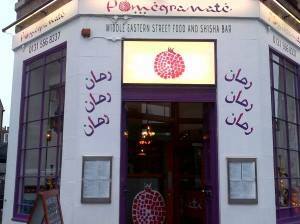 After an 18-month sustained campaign of harassment led by a neighbour, Pomegranate Restaurant (located at Antigua Street, Edinburgh) is being forced to remove ALL the lighting and signage from their business. The attached photo shows their "offensive" menu boards and their "eyesore" restaurant frontage. Having to comply with this order will have serious negative repercussions for this extremely popular restaurant. It will, in all likelihood, cost the owners and the many staff that they employ their livelihood. The previous establishment at the premises, an Italian restaurant, traded for over 20 years without any problems. As a Middle Eastern restaurant, however, they have been plagued by complaints. If you love Pomegranate and their food, or you simply find this situation completely unfair, please sign this petition and make your feelings known. By signing, I authorize Jamal and Lisa Ahmed to hand over my signature to those who have power on this issue.